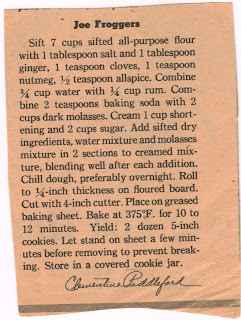 I apologize for the long delay in posting the conclusion to this recipe, but the inspiration I got from the clipping has had me immersed in research about the woman whose name appears on the bottom: Clementine Paddleford. She is truly a remarkable woman, a legend in food journalism and I want to try to do her justice in this post. This is a long post and I don’t have any pictures to include, but bear with me, I promise that Clementine’s story is worth the read. Paddleford is credited with changing the way America wrote about food. Before her, there were no articles to accompany recipes in newspapers; it was just a list of ingredients and instructions. Today, that might be hard to conceive of because we are surrounded by The Food Network and people, such as Anthony Bourdain, who bring us cooking stories from exotic places across the globe. But Paddleford was truly a pioneer in this type of food reporting. She connected with her readers in a remarkable way and at the time of her death in 1967, it was estimated that she had 12 million readers. Clementine Paddleford was born in Stockdale, Kansas on September 27, 1898. Her childhood in the farming country of the Midwest would be the catalyst for the incredible bond she had with the women of America. Her interest in writing began at an early age and when she attended Kansas State Agricultural College, she pursued a degree in Industrial Journalism. This was very uncommon for women during this time, most received their degree in Home Economics. Paddleford’s writing career led her to New York, Chicago and eventually back to New York. She wrote for such publications as Farm and Fireside, the Christian Herald, and Gourmet magazine but it was her position at the New York Herald Tribune and This Week magazine where she published her weekly article entitled How America Eats that would truly secure her place in the world of food journalism. Paddleford didn’t just write about the food she ate, she dug into the history of the recipe, met with the people who cooked it, and traveled worldwide in search of stories that would resonate with her readers. She estimated that during her career, she traveled more than 800,000 miles in search of stories about food. She traveled to Maine to learn about lobster and discover ingenious new ways the locals were serving the crustacean. In California, she immersed herself in wine country and met a family who was just getting started in the wine business: the Mondovi family (sound familiar?). She even boarded the atomic submarine, Shipjack, to learn about its kitchen and report on the meals being served all while traveling the depths of the Long Island Sound. But her favorite place to travel to was the Midwest where she had roots. The world changed a lot during Paddleford’s lifetime, especially in relation to food. Her career began during the Great Depression and World War II, which she responded to with articles about making the best meal from what you have. Later on, women’s role in the kitchen began to change. They were finding jobs outside of the home and were now spending minutes on meal preparation instead of hours. Paddleford published quick tricks for dinners and helped women find ways to save time making meals. Toward the end of her career, Americans began to worry about weight issues and again Paddleford met these concerns with recipes that were leaner in calories, but not in taste. Paddleford had an indomitable spirit and possessed unstoppable motivation. At the young age of 34 she developed a malignant tumor on her larynx, which was removed along with her vocal chords leaving her to relearn how to speak through a breathing tube in her throat. But that didn’t slow her down. She disguised the tube with a velvet choker that became part of her trademarked look and continued with her work. The surgery transformed her voice into a raspy, hoarse whisper and, as a result, she declined any public speaking opportunities after her recovery. In 1960, she published a cookbook that bore the same name as her column: How America Eats. It contained reprints of the articles she wrote and was divided not by recipe type, but by region of the country from which she discovered each recipe. In it, is a copy of the recipe and article Clementine Paddleford wrote for Joe Froggers. I also traced a copy of the article back to the May 2, 1954 issue of the LA Times through their archives. I’d love to post a copy of the full article for you to read, but unfortunately copyright laws restrict me from doing this. If you would like to see the original article, click here to go to the archives and search for Clementine Paddleford’s article titled “Spice Wheels” that appeared on the aforementioned date. The cost to download a copy is $3.95. Or you can view the article on page 24 of Paddleford’s cookbook, How America Eats. Through my research, I discovered I had a lot in common with Clementine Paddleford. She loved to travel, was a poet and an avid keeper of scrapbooks. She was very close with her mother and also married an engineer (however, they never lived together and eventually got divorced). But I think what I related to the most was the purpose for her writing. She wasn’t a chef, in fact, she rarely even cooked. What fascinated her were the traditions and memories baked into every dish she ate across the globe. Every recipe has a story and Clementine Paddleford made it her life’s mission to discover as many as she possibly could. In fact, she even got her pilot’s license to aid in this quest. Clementine Paddleford died on November 13, 1967. She had several bouts of pneumonia and it was believed her body was taken over by cancer at the time of her death. In her will, she bequeathed all of her work to her alma matter, Kansas State University. In total, 274 standard-size file boxes were transported to Manhattan, Kansas where, sadly, they sat virtually untouched for 34 years. But in 2002, two women began their own quest: to resurrect the memory of the woman who Time magazine named America’s “best-known food editor” in 1953. Kelly Alexander, then a food writer for Saveur magazine, and Cynthia Harris, an archivist at Kansas State University, teamed up to write an article about Paddleford for the November 2002 issue of Saveur (click here to view a copy of the article). But it didn’t stop there. They went on to write a book titled Hometown Appetites: The Story of Clementine Paddleford, the Forgotten Food Writer Who Chronicled How America Ate. In addition to being a complete biography of her life, the book contains wonderful photographs of Paddleford, quotes from her articles and many of the recipes she dedicated her life to discovering. I immediately located a copy of the book and devoured it in a few short days. I have even talked my husband into planning a trip to Kansas to visit her archives. It saddened me to see the word “forgotten” in the title of her biography. Just like my discovery of Lucretia Brown, I found it fitting that I was introduced to this inspiring woman with a voracious appetite for life on my journey through the Found Recipe Box. I wish it contained more of her clippings. But just having this one was enough to whet my appetite and encourage me to continue my pursuit to learn more about her life. A lot has changed since Paddleford’s death in 1967. You can’t scroll through the television listings without seeing at least one type of show about cooking – from Iron Chef to Man vs. Food, Anthony Bourdain: No Reservations to Hell’s Kitchen. America is obsessed with food. But how many of us spend the time to actually learn the history of the food we eat or even take the time to make an heirloom recipe? We’re too busy. We’re a nation of fast food. Unless it’s a special occasion or a holiday, most people find food that can be popped in the microwave or put together in a matter of minutes. I am guilty of this too. Until I lost my job, I never had the time to construct a fancy meal for dinner, let alone take on a project of cooking an entire recipe box full of made-from-scratch recipes and writing about them. For this experience, I guess I’m thankful to be unemployed. Everything happens for a reason. And without this project, I never would have been introduced to Clementine Paddleford. I’d like to thank Clementine, for opening the door to a whole new way of writing about food and reminding us that there is a story behind every bite we take. For traveling hundreds of thousands of miles in search of the stories that shaped people’s lives and what they served on their dinner tables. Clementine, you are not forgotten. In fact, I will always hold a special place for you in my heart and maybe, someday, we’ll be seated together at the great Dinner Table in the Sky where we can swap stories about our favorite hometown dishes. Hi I enjoyed reading your beautiful post about Clementine Paddleford. Thank you for sharing.